Persistence Market Research offers a 4-year trend analysis for 2012 to 2016 and 8-year forecast for Gas Leak Detectors market between 2017 and 2025. This study demonstrates the market dynamics and trends globally across five regions North America, Latin America, Europe, Asia Pacific, and Middle East and Africa which influence the current nature and future status of the Gas Leak Detectors market over the forecast period. This research report provides detailed analysis of Gas Leak Detectors market and offers insights on the various factors driving popularity of these systems. The market study includes a comprehensive assessment of stakeholder strategies for achieving success in the market. The report segregates the global gas leak detectors market on the basis of product type, application, technology and region. By product type, the market is segmented as portable and fixed. The report starts with an overview of the global gas leak detectors market in terms of value. In addition, this section includes analysis of factors, opportunity analysis and technology trends that influence the gas leak detectors market. Impact analysis of key drivers and restraints based on the weighted average model and PMR analysis and recommendation is included in this report to facilitate clients with crystal clear decision-making insights. Global Gas Leak Detectors market is categorized on the basis of product type, application, technology and region. On the basis of application, the market is segmented as industrial, commercial, residential and others. The technology segment is segmented into electrochemical, semiconductor, ultrasonic, infrared and others. A detailed analysis has been provided for every segment in terms of market size analysis for gas leak detectors across different regions. The section comprises an in-depth assessment covering critical drivers, restraints and trends and regulations in the region. This section further highlights market presence (intensity map) for key representative market participants. The next section delivers a detailed study of gas leak detectors market across various countries in the region. It provides a market outlook for 2017–2025 and sets the forecast within the context of gas leak detectors including latest technological developments as well as service offerings in the market. This study mentions trends within countries contributing to growth of the market as well as analyses the drivers that influence the market in each region. Regions and countries assessed in this report include North America (U.S., Canada), Latin America (Brazil, Mexico, and Rest of Latin America), Europe (Germany, UK, France, Italy, Nordic, Russia, Poland and Rest of Europe), Asia Pacific (China, India, ASEAN, and Australia and New Zealand), Middle East and Africa (North Africa, South Africa, GCC, Rest of Middle East and Africa). This report evaluates historical trends, present scenario and the growth prospects of the gas leak detectors market across various regions globally for the period 2017 –2025. We have considered 2016 as the base year and provide data for the trailing 12 months. To calculate global gas leak detectors market size, we have considered country wise adoption rate of gas leak detectors across different verticals. Further, we have analysed the revenue contribution from gas leak detectors players. The forecast presented here assesses the total revenue by value across the market. In order to offer an accurate forecast, we started by sizing the current market that forms the basis of how the gas leak detectors market should develop in the future. Given the characteristics of the market, we triangulated the outcome of different types of analyses, based on adoption trends. In addition, it is imperative to note that in an ever-fluctuating global economy, we not only conduct forecasts in terms of CAGR, but also analyse on the basis of key parameters such as year-on-year (Y-o-Y) growth to understand the predictability of the market and to identify the right opportunities across the market. 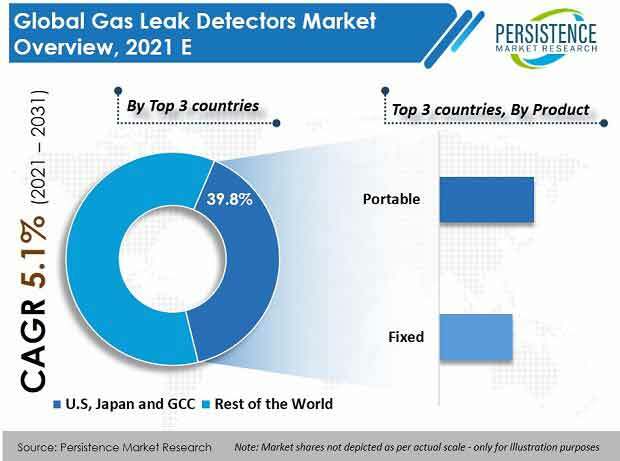 As previously highlighted, the global gas leak detectors market is split into a number of segments. This detailed level of information is important for identification of various key trends of the global gas leak detectors market. In the final section of the report, we include a competitive landscape to provide clients with a dashboard view, based on categories of provider in the value chain, presence in Gas Leak Detectors portfolio and important differentiators. This section is primarily designed to provide clients with an objective and detailed comparative assessment of providers specific to a market segment in gas leak detectors value chain. Report audiences can gain segment-specific vendor insights to identify and evaluate relevant competitors based on a comprehensive assessment of their capabilities and success in the marketplace. Detailed profiles of providers are included in the report to understand their long-term and short-term strategies, product offerings in the Gas Leak Detectors market space. Prominent companies in gas leak detectors market are: MSA Safety Inc., Honeywell International Inc., Tyco International PLC, Emerson Electric Co. and Draegerwerk AG & Co KGaA. Gas leak detectors are equipment that indicate the presence of gases in ambient air using technologies such as electrochemical, infrared and ultrasonic. These devices are used to detect toxic and combustible gases in order to maintain safety. Various industries are focusing on the use of advanced portable gas leak detectors in order to maintain higher safety standards. The demand for portable gas detectors is increasing as they are mobile and help ensure better personal safety in hazardous work environments. The global Gas Leak Detectors market was valued at US$ 2,689.1 Mn in 2016, and is expected to register a CAGR of 6.5% during the forecast period (2017–2025). Demand for gas leak detectors is likely to be driven by increasing investment in oil & gas and chemical industry. According to the report ‘Gas Leak Detectors Market: Global Industry Analysis and Forecast 2015 – 2020’ published in 2015 by PMR, revenue generated by global gas leak detectors market was estimated to reach US$ 2,429.2 Mn by 2015, witnessing an increase from US$ 2,312.2 Mn in 2014. The CAGR of global gas leak detectors market during the period 2015 -2020 was 5.2%. Global Gas Leak Detectors market is categorized on the basis of product type, application, technology and region. On the basis of product type, the market is segmented as portable and fixed. Portable segment is anticipated to register a CAGR of 6.5% during the forecast period. The application segment is segmented into industrial, commercial, residential and others. Industrial segment is projected to register a CAGR of 6.4% during the forecast period. On the basis of technology, the market is segmented as electrochemical, semiconductor, ultrasonic, infrared and others. Electrochemical segment accounted for highest market share 37.0% in 2016. Moreover infrared segment accounted for a market share of 21.0% in 2016. Ultrasonic segment is predicted to register a healthy CAGR of 7.2% during the forecast period. Among the regions, Asia Pacific accounted for the largest market share in 2016 on account of growing need of gas leak detectors in oil & gas industry and increasing infrastructure development. In addition to this, demand for gas leak detectors is increasing in the markets in North America as well.